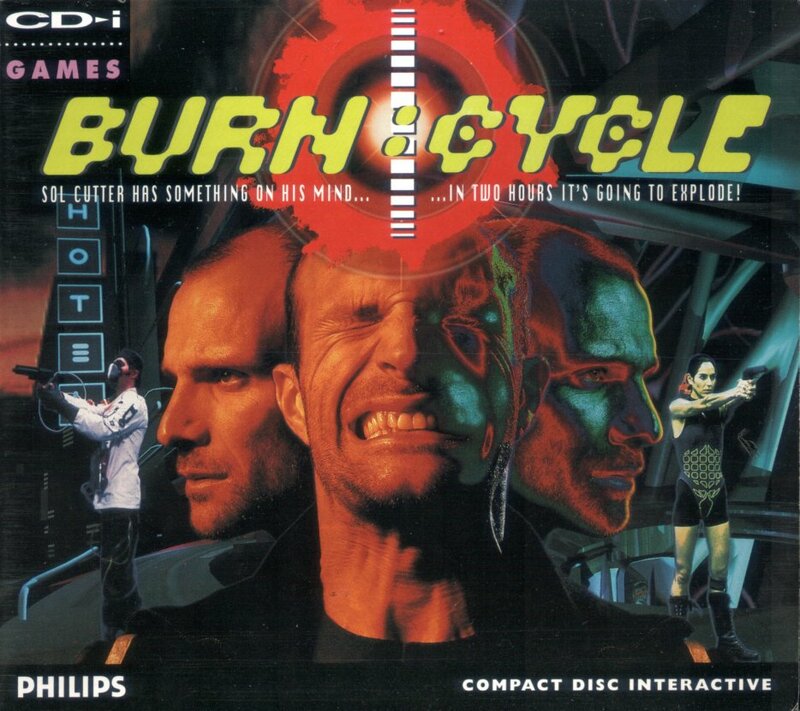 “Burn: Cycle” was a 1994 videogame for the short-lived CDi console by electronics giant Philips. Along with “Dragon’s Lair”, “Mad Dog Mc Cree” and “Chaos Control”, it was one of the launch titles. The CDi was mostly universally panned for its price, graphics, games and controls. Videogames were its secondary market, as it mostly focused on self-improvements programs and edutainment (portmanteau of education and entertainment). Unsurprisingly, the CDi died an embarrassing death, but not without leaving at least one title that ensured it legacy in the memory of many gamers. The story is a combination of Blade Runner and Philip Marlowe detective novels, juxtaposing noire stylings with a cyberpunk setting. For a mid to low-budget game the whole premise is surprisingly ambitious. The production values of the full-motion video scenes are shoddy at times and the acting varies wildly from one actor to another. The title is mostly remembered for it fusion of full-motion video with computer generated backgrounds, and an ambient/techno soundtrack by Simon Boswell. On the whole, this forgotten game was a gamble on all fronts. Sadly, the gamble never took off and this is the only title in what arguably could have been a potentially interesting franchise. In the game we meet Sol Cutter (Aaron Swartz), a small-time data thief/courier and one-time security officer, who gets infected with malicious software while on a job at Softech. This leaves him infected with the Burn: Cycle virus, a so-called Logic Bomb, that leaves him a one hell of a headache and is set to melt his brain if he doesn’t diffuse it in two real-time hours. Cutter must now flee from the Softech headquarters, along with his trusted ally Kris (Viva Duce), and seek out who set him up. “Burn: Cycle” was released one full year before “Johnny Mnemonic” would hit multiplexes. Four years before “Dark City” and a half decade before “The Matrix”. The game itself is a rather slow affair that mostly consists of traveling the various locations in search of clues to help you along the way. Most of the game consists of various puzzles and some fetch quests to keep the pace going. While the shooting galleries aren’t especially difficult in themselves, the game is very punishing and wholly unforgiving all around. About three or four shots and you’ll see Cutter die with a grunt and a splatter of digital blood. The supporting cast and extras consists of stereotypical archetypes of the science fiction - and action genre. While they aren’t the most stimulating, their backstories and lines of dialogue betray far more depth and pathos than their initial looks would suggest. There’s far more than meets the eye. “Burn: Cycle” isn’t so much about action, gunfights and explosions as it is about immersing the player in its gloomy, eternally shrouded in twilight environment of uncaring multinational corporations, shifting loyalties, life-changing software and the very people behind the brands that make up every day life in this world. The game pervades a sense of utter nihilism, and portrays the inherent pointlessness of physical existence in a world where the rich and powerful have moved to a digital way of living. The juxtaposition of bright colors and cold metallic surfaces convey this contrast rather well. The game’s focus lies squarely on its puzzles and fetch quests. Urban Central, where the lion’s share of the game takes place, consists of all that. In order to progress you’ll need to call in a friend’s favor, find the item they desire and you’ll move on to the next person who can be of help in your quest. Those persons will again send you on one quest or another – while doing all that you’ll need to keep out of the hands of enemy agents and see that you don’t get shot while doing so. The old Sierra adage: “save early, save often and don’t overwrite saves” rings especially true here. This was the time when games didn’t pamper their players, didn’t hold their hands through out the entire duration. The player had to use his wits often and all the time. When you died, there was no one to blame but yourself. Forgot to save at the critical junction? That’s too bad, start over from the beginning. Ah, those old times! Some of the recurring concepts, the in-game mythos and narrative ideas are enough to fill an entire trilogy of games on its own. Everything in this cold and uncaring world is driven by personal gain and monetization more than anything. For starters, three cutthroat software corporations rule the every day life. Cortex and Semtex are the civilian branches, and Softech is the military arm. All three operate on the shady grey areas of law and legality, and all three are one step away from an all-out corporate war for market monopoly. Cortex appears as the lesser evil of the two, although Semtex’ line of business is never truly explained to any reasonable depth. It is clear that all three firms will stop at nothing to reach their objectives for market monopoly. Schemes and corporate espionage is the order of the day, and corporate “adjusters” are needed to see that competitors are weakened, either from within or through external force. In order to sedate and placate the civilian masses, Softech has devised the ultimate experience with Trip World, an orbital theme park. “Rushing” is in with hackers, and Psychic Roulette is the newest trend in gambling. Information means currency (either in credits, or Nigerian rand) and ASCII is the number one entity to scan and sell information found in and on the Televerse. ASCII operates in numerous independent branches called drones. These are bodies (or hosts, rather) for the system to enter into everyday civilian life to sell its services to its many clients. Whether these drones are man or machine remains ambiguous, as is the nature of ASCII itself. The Karmic Church and the New Age Movement is an alternate take on organized religion. Its new age design is deceiving and there’s something strangely cultish about the whole. Buddhist philosophy, meditation and spiritual enlightenment are merged with corporatization. Forgiveness is commoditized and monetized to the utmost extreme. At the Karmic Church a person can ask absolution from past misdeeds and transgressions, given that said person has a good credit line. Then there’s the Sum Zero Bar where smugglers, pirates, hackers and other criminals mingle with civilians, whether they be digital or physical beings. A terrorist organization called NAMO wants to take down the Televerse (and its inhabitants) for undisclosed reasons. Plastic surgery is widespread and common among all lines of civilization. In an offhand comment Sol dryly mentions he had a “different face” when he met Gala originally years before the game. Gala is (or was) part of an extermination squad to liquidate suspect and captured undercover agents within the ranks of NAMO’s operatives. The Televerse is the global communication system of choice for individuals and corporations. The Televerse is both universal to its user pool, and unique to the individual user itself. Through the usage of a Comport or the User Interface, a user can communicate with ASCII to a obtain credit, or general information about themself, the data they are carrying, who is monitoring them and so on. There are several layers to the Televerse, and access to these is dependent on the “level” of the user. Only a “super user” can enter the deeper layers of the Televerse. Along with the User Interface, there’s the general entrance called The Pulse, which is a digital representation of all raw data currently in and entering the Televerse. In order to access the digital imprints of one’s memories the user needs to be downloaded into User Interface as a construct. From this place he or she can choose to enter Nirvana, which is a barren desert looked over by threshold guardians, and housing a floating labyrinthine grid of data constructed entirely out of interconnected personal memories of the user currently within its confines. One of the recurring themes through the game is that of physical and digital immortality. Veilli, one of the characters the player meets later in the game, has devised the technology to allow people to download their consciousness into the Televerse, and to swap bodies as they please. Thus allowing great minds to continue their work in the philosophical and scientific world, without having to worry about physical and bodily limitations. Cortex, the corporation that monitors the Televerse wants sell this very same technology to the highest bidder behind the back of its creator. Softech, the villainous corporation seeking Sol, has its own plans for the technology and wishes to produce it for the mass market. Nothing is sacred in this world. As touched upon earlier “Burn: Cycle” was a fairly ambitious undertaking. The story and central mythos are taking inspiration from literature, philosophy and religion (Buddhism) - this is not so much a game, but a veritable experience as its universe is so engrossing and complex despite the brief nature of the narrative. The soundtrack also helps tremendously in terms of atmosphere and immersion. In other words, the universe, the central cast and the lore alone are enough to fill a movie, or three. Despite the conclusive but strangely positive open ending a second game was never produced. It is really a shame that this was the only title of what could have been a spectacular series in the right hands. There’s so much material and interesting characters to work with. At one point Cutter and Gala reference the 1942 classic "Casablanca" by lifting a line of its dialogue in what probably was meant to be a throwaway one-liner. After this game everybody from the principal cast continued work like the working stiffs they are. Nobody was able to force a real breakthrough of any kind, except for antagonist Dealey, portrayed by David Sterne. He seems to be the only one to have maintained a steady career in TV and cinema, although Canton and Swartz did deserve a better fate than they got. Gabriel Canton appeared in “Lost In Space” and Viva Duce had guest roles in “East Enders”, “Casualty” and “The Bill”. Aaron Swartz had a role in the Samuel L. Jackson flick “The 51st State” and also appeared in “Entrapment”. Other than having a recurring role in the TV series “I Shouldn’t Be Alive” and an uncredited guest spot on “Spooks”, Swartz’s career didn’t take off in any specific direction. Director Eitan Arrusi went on to write the script for the 2001 TV drama/comedy “Is Harry On the Boat?” and the 2002 horror movie “Long Time Dead” (which was critically savaged). A few years later, in 2008, he directed the critically panned horror flick “Reverb”. What happened to game director David Coullier is hard to tell, as a web search didn’t yield any results to speak of – the game did nothing to forward anybody’s career, and that’s a bit sad considering how interesting and ambitious this title was.